Published: Jan 6, 2016. 13:55 +0100. Editor’s Note -10th January 2016: Please see this post for an update. We only just reported on comments by Gary Illyes that there will still be some delay before Google Penguin starts rolling out. Not more than a few hours later, we see “some” chatter that the Update may have started. We have our doubts. There is increasing chatter on the various SEO forums, as well as the SERP Trackers (we will cover all these points shortly). However, the main indication is a specific mention by SERP tracker tool AccuRanker. They have specifically raised the possibility that Google Penguin is now rolling out across the United States, with a blog post titled “Penguin 4.0 January 2016: Possible Google Algorithm Update Today?“. SERP Trackers are in an ideal position to ascertain trends \ volatility due to the sheer number of websites \ keywords they monitor. As such, this gives a great indication of when something is up. This is showing some volatility, including up to and including the 6th January 2015. However, there is not spike like in the Google Grump tool above. That being said, it may be that the spike may show on the 7th instead, so we need to wait a little longer for this information. This shows a massive spike commencing on the 4th January, and increasing significantly on the 6th January. This clearly supports the fact that something is up. It is useful to check out what other webmasters are saying, especially those who are seeing some volatility to see if there are any clues as to whether they have previously suffered from Google Penguin and recovered, or perhaps they use spammy techniques and have now been hit by the penalty. There is only one thread here, which has not yet garnered any replies. The post seems to imply that the author is seeing something, but does refer to the Google Grump post as well. 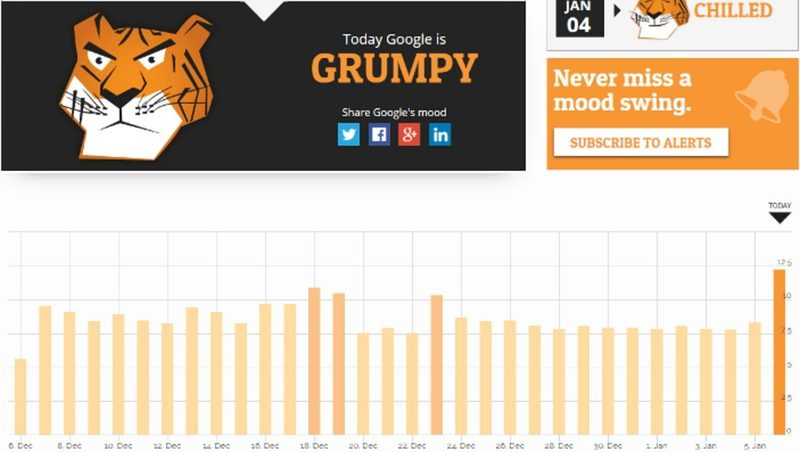 It could be the post was prompted by the Google Grump Post by AccuRanker, but is difficult to tell. Black Hat World too, seems to have a similar post made to the one in the DigitalPoint Forums. The response seems to be lackluster as if no one sees any movement themselves. One reply refers to MozCast, but this may be from before it updated with data from the 5th January. Unfortunately, this does not help us much, except to the extent it implies that there may not be a major update going on. Very odd, as the SERP trackers do show something. Again, this forum shows very little too. Despite AccuRanker crying wolf, and the activity in the SERP trackers very compelling in that they indicate a fair amount of volatility, we are beginning to have our doubts. Certainly, if Google Penguin were rolling out there would be a significant number of SEO specialists adding to the conversation right now. There isn’t. We believe it is more likely just to be tremors arising from the November Update, but we will, of course, keep an eye out and update this post as soon as we know more. Update 1 — 7th January 2016: We are seeing some considerable movement in our own rankings today. For us, it is mixed, with some minor improvements and some minor declines. However, some of our older, not so great, content seem to have taken a small hit dropping half a dozen or so places. We suspect this update relates to content quality and are testing this by improving some of the content that saw falls. Temps yesterday and In-depth Article count (for 2 days) are wrong. Should have updated data tomorrow (due to some Google changes). Update 3 — 7th January 2016: It appears to be our older \ poorer quality content that has dropped a couple of places (1-5 places) in the SERPs. Good quality content has remained steady or increased. A couple of keywords that we tracked had only minute relevance to a page (i.e. a not so closely related keyword we hadn’t specifically covered) dropped significantly, which was interesting. This seems to imply the changes are focusing on content quality \ relevance. 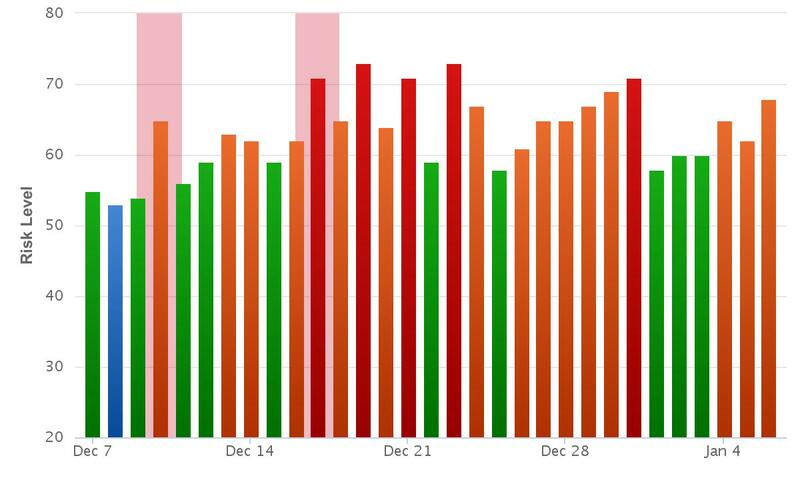 Update 4 — 8th January 2016: We are seeing some fluctuations with the SERPs seem to be constantly changing. One user at Webmasterworld concurs, stating that “Since yesterday I’m seeing 2 data sets switching by the minute.” This may indicate that they are doing some major testing of differing data sets \ algorithms. The best thing to do right now is not to panic and wait a few days until it settles down. We have also seen Google Testing other things such as blue rating stars in the SERPs rather than yellow.